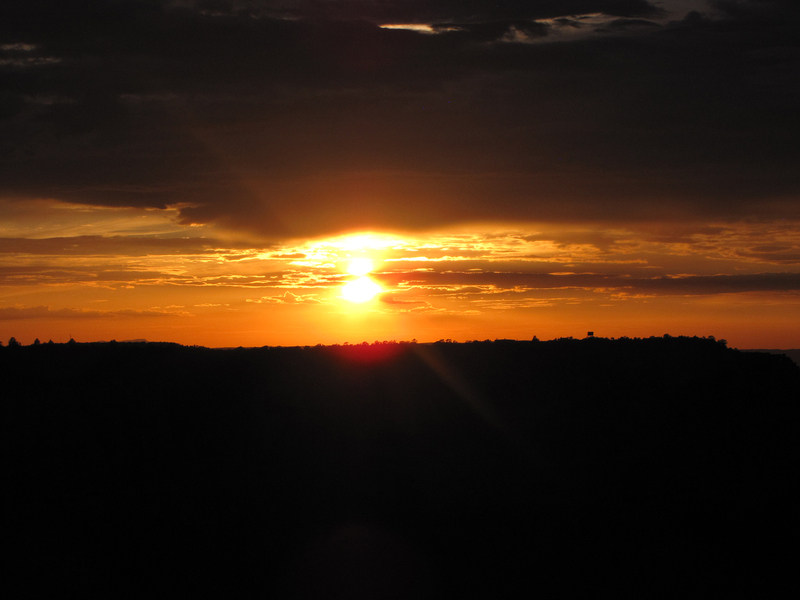 So I am sitting in a comfortable apartment overlooking the La Brea Tar Pits in Los Angeles, but today’s post is all about Arizona. Arizona is a state loosely affiliated with the United States of America. I say “loosely,” because they have done their best over the last few years to exempt themselves from every possible federal law, including Daylight Savings time. Now, when I think of The Copper State, I generally think of their insanely conservative politics, and I imagine this vast, choking desert from which these bitter, stunted people must spring. But Arizona is not all desert! 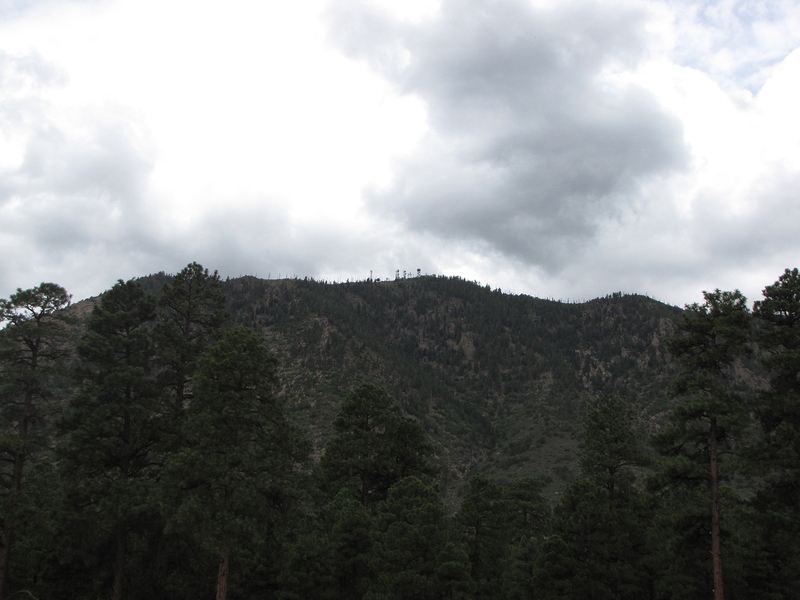 Flagstaff, for example, is very lovely. I turned around from pumping gas and saw a scene that may have been plucked from the Pacific Northwest. Evergreen trees and mountains dominated the landscape, and when the skies opened up and rain poured down upon us, it was hard to remember where we really were. It wasn’t until we were several miles out of Flagstaff that things started looking more Arizona-y, but then it just shifted right back as we approached the Grand Canyon. Possibly the best view from a gas station ever. 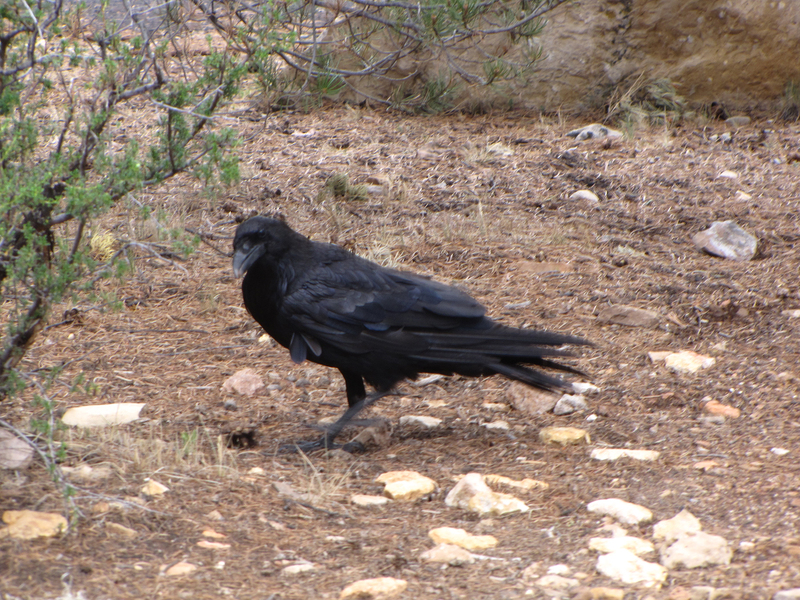 We checked into our campsite before heading to the Canyon, where we noticed that the park rangers were warning us about ravens, of all things. Apparently, any food left in their sight is fair game, and they will peck right through styrofoam coolers to get at it. We thought we’d be on the lookout for mountain lions and bears, not birds. But sure enough, as we set up our tent, we started seeing them. These were hulking ravens, clearly the descendants of the great Roc of Arabian legend. Nothing bothered them, nothing fazed them. Only the cold steel and glass of our Honda Fit kept them at bay. Instead, they went after easier prey; an unattended child was carried off into the cloudy Arizona sky. I will not even attempt to describe the Grand Canyon. I will say that it is one of those rare tourist destinations that more than lives up to the hype. It is awe-inspiring and all of that, and everyone should try and make it out there even if it’s just to peer into it for a moment. 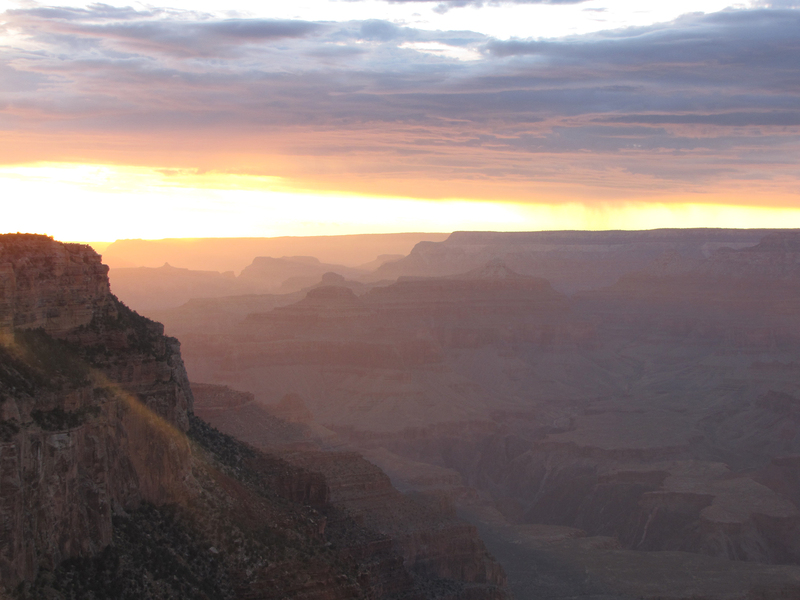 We were fortunate enough to see sunset AND sunrise at the Grand Canyon, and it’s easily been the highlight of the trip so far. All right, all right, you’re pretty damn Grand. It did, however, rain. Our first foray around the South Rim was cut short by a downpour that left us soaked and sprinting towards the Visitor Center. The elk were undeterred, however. As stubborn and acclimated as the ravens, the novelty of having elk around quickly vanished. They were everywhere, grazing around campsites, holding up traffic, doing an incredibly poor job of sacking at the General Store, and loudly complaining about their cell phone reception. Okay, now you’re just showing off. And yes, even at the Grand Canyon, one of the world’s most incredible natural landmarks, people were preoccupied with their cell phones. I kind of expected it from the younger crowd, but there were even some middle-aged folks chatting away, seemingly oblivious to the Grand Freakin’ Canyon. I’m not even sure how they were getting reception, because I certainly couldn’t when we waited out the rain in our tent. It was difficult to leave in the morning. Mostly out of a desire to continue soaking in the beauty, but also because the ravens had surrounded our camp overnight and we were forced to blast our way through with the large-bore shotguns provided to us by the park rangers. So it was with a heavy heart and a car splattered with raven guts and feathers that we departed the Grand Canyon and made our way to the border of The Golden State, California. 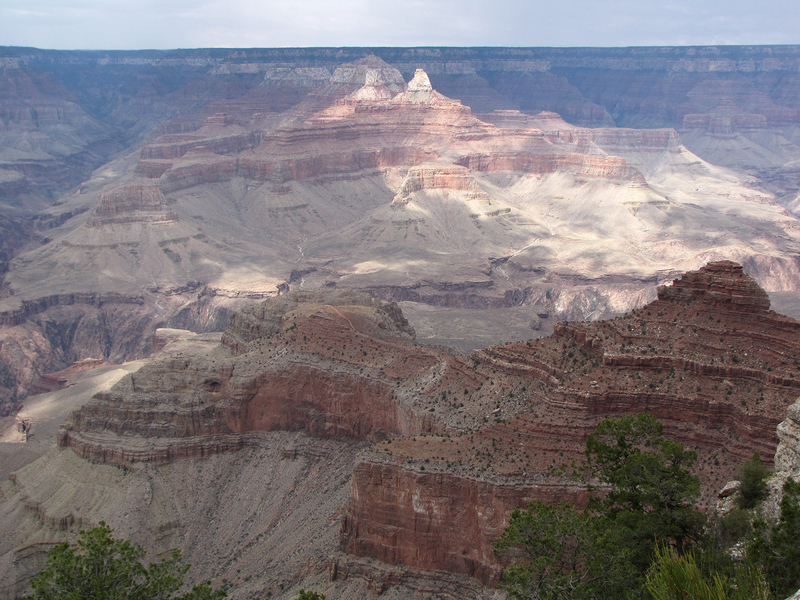 Tags: Arizona, Grand Canyon, life, photography, travel, writing. Bookmark the permalink.